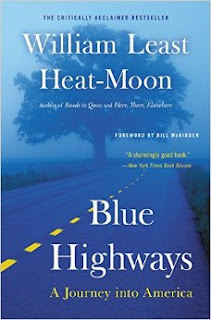 I'm reading Blue Highways, a gift from my friend Marion, in a way author William Least Heat-Moon never intended and probably couldn't have foreseen. Blue Highways is Heat-Moon's travelogue of his three-month loop through the backroads--the map's blue highways--of the United States in 1978. It was a bestseller at the time, and a book I always knew about and wanted to read but never quite got to. Now I have. Blue Highways is partly an elegy to a then-vanishing America, where people lived as they had fifty years before. 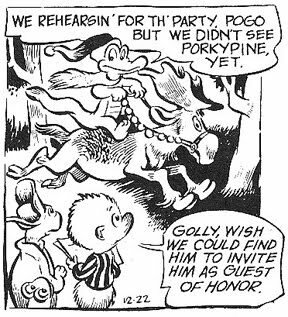 Heat-Moon didn't have to wander far off the interstate to find folks living in tarpaper shacks with no plumbing, drinking free spring water that bubbled up from half a mile underground and eating whatever they could catch from the local pond. The book has one foot in the then-now and another in the past. Reading it today, nearly forty years after Heat-Moon's odyssey, piles another time shift on top. Now I can follow his route on Google Maps, and use Street View to tour the towns he traveled through. I can Google the businesses he patronized and the people he met. Some of them turn up. Heat-Moon didn't know how all the stories he told would turn out; now, I can look up the endings of at least a few. 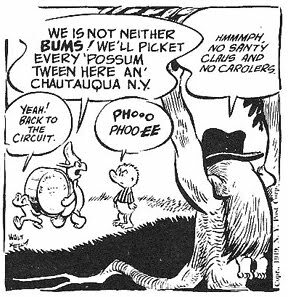 Not surprisingly, most of Heat-Moon's America from fifty-years-before-1978 appears to be gone. A little more surprisingly, so does a lot of his America from 1978. It wasn't that long ago. I was there. Blue Highways did (unintended?) double duty, documenting both its past and its present before they both passed into its future--where I can ride along with Heat-Moon on a computer that's about the same size and weight as the paperback edition I'm reading. Golly, I haven't blogged in a couple of months. I may have run out of things to say, or outgrown the conceit that anyone cares. My intentions are good. Maybe next year. 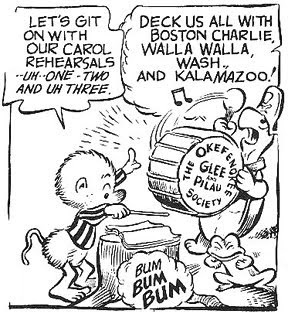 However, I can't let this year pass without posting a bit of whimsy that's been a tradition on my blog every Christmas Eve since way back in aught-five: "Pogo" cartoonist Walt Kelly's timeless carol, "Deck Us All With Boston Charlie." 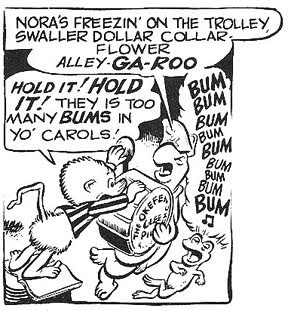 You know the tune. 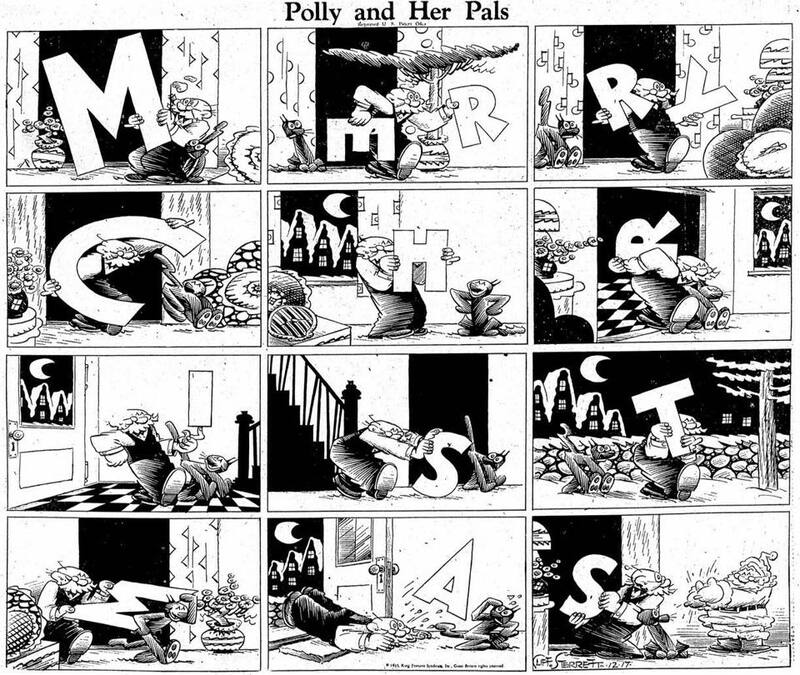 After that, for the first time ever, I've added a bonus cartoon by "Polly and Her Pals" cartoonist Cliff Sterrett, who in my opinion is the greatest underappreciated cartoonist you've never heard of from the first half of the 20th Century. I love Sterrett. This'll suggest why. All my best for today, tomorrow, and the New Year. Thanks for reading.